You are familiar with surround sound, but do you know about round sound and around sound? Soundcast’s new Melody Bluetooth wireless speaker is the ultimate Beach Boys fantasy come true: Round round get a round I get around! Melody is round in shape, and it gets around, going everywhere with you with its round array of speakers and built-in handle. The case is weatherproof, but don’t leave it outdoors in a Hawaii downpour, Arizona summer day, or Minnesota blizzard. You want loud? 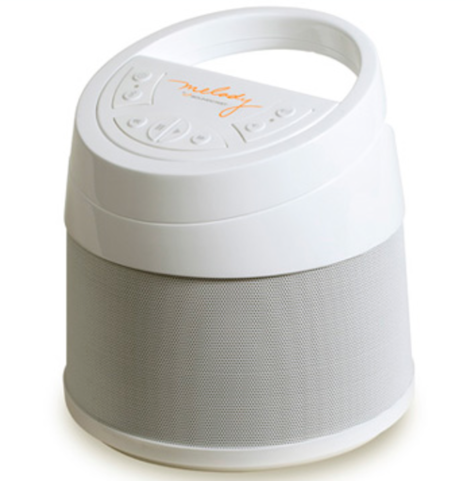 Melody with audio source at top volume fills your house, outdoor patio, office party, or apartment meeting room with more sound that you expect from its compact size and modest weight. Audio delivery is a bell curve, with midrange dominating over treble and bass. Ultra-low bass tracks may distort and rumble at super max volume. 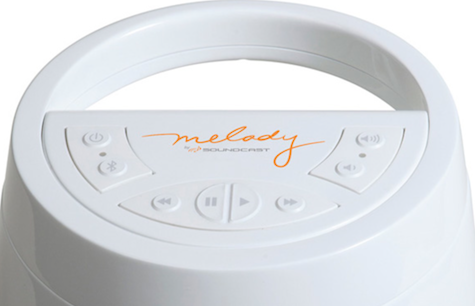 Melody isn’t an audiophile speaker, but for portable pop, it’s near the top. When you take it camping and put on Led Zeppelin, be considerate of your neighbors and other sensitive animal life. Bluetooth connectivity is straightforward, and wireless range is up to a moderate 30-feet in our testing, although other reviewers had better distance results. Cables and plugs are provided for AC wall, computer USB, and 12 volt car charging, plus a port and cable for an external audio device. Melody requires several hours of charging to be able to play back for up to an impressive 20 hours, depending upon volume settings. An exceptionally-thorough round User Manual is provided that explains the buttons and ports, all of which are easy to learn and use. There is no remote control provided, because you are supposed to control your music remotely. Melody’s outward-facing speaker setup has “Four full-range drivers + Four bass radiators in a stereo 360° array using IMPP cones and rubber surrounds.” IMPP equals injection-molded polypropylene, but don’t ask me for a technical definition. Round sound radiates from Melody in every direction equally, which is perfect for a party or event. The effect is a single source, as opposed to any form of stereo separate channel audio. Big sound from a small, central space comes with a big price from a small credit card. If 360° sonic shock waves are more important to you than sticker shock, Soundcast’s Melody is a worthy musical powerhouse. Versatility, portability, and volume are its strengths; high cost and midrange emphasis are its drawbacks. A full-spectrum song used to evaluate melody’s performance was Telephone by New Hampshire Notables on Voices Only 2011.